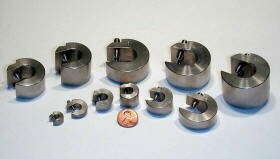 Stainless Steel Balancing C-Clamps Reliability Direct, Inc. Your Direct Source for Reliability, Maintenance, Test & Measurement! CDI-STSC-125 CDI-STSC-125 - 0.125oz SS Balancing C Clamp, 3/16"
CDI-STSC-25 CDI-STSC-25 - 0.25oz SS Balancing C Clamp, 5/16"
CDI-STSC-50 CDI-STSC-50 - 0.50oz SS Balancing C Clamp, 5/16"
CDI-STSC-75 CDI-STSC-75 - 0.75oz SS Balancing C Clamp, 5/16"
Stainless Steel Balancing C-Clamps are used in a few applications such as food and drug handling where non-reactivity is a priority.